Continue reading to find out how we made $986 in 3 days! So everyone has had a yardsale once or twice before. But was it successful? My Grandmother had rented out her old house to my Uncle, he was offered a new job in Florida and he just couldn’t turn it down! We were all so proud of him but he left behind ALOT of stuff! i mean we had furniture clothes toys games exercise equipment you name it we had it! Well where to begin right? i took us about a week to gather everything up and sort through it, it took us another week just to price everything but we got it done. Now we spent a lot of time planning so that we could make the most money. If you didn’t know this already, there are many social media sites that can really boost up your yard sale. So don’t just go the traditional sign route get creative! So about 3 days before the big sale we took pictures of some of the big ticket items and and a few photos of the whole spread. I then went on Craigslist, Offerup (phone app to sell things), and Facebook! Yes Facebook, in my area we have a Somerset/Swansea yardsale page. We advertised the posts as Huge Moving Sale. 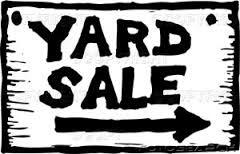 Now the #1 key to having a yard sale is to have it on a busy street. Unfortunately our street was about 1/4 mile away from the main streets. We made about 20 signs to place around town, we used neon pink poster board and about 25 Black markers! We put arrows on all of them to guide people in the right direction all they had to do was follow the signs! We decided to do Sunday and then the next week we did Saturday and Sunday. Because we were splitting it into two weekends we decided to not put everything out on the first day. That first Sunday we made about $200. The next weekend we had a Huge turnout we put exercise equipment and tools in the Garage (we made a sign to let people know they could go in the garage), all the furniture in the driveway, and all the toys dishes and misc stuff on the lawn on tables. Keep in mind now there are three of us my grandmother (shes an active grama) my boyfriend, and myself, and we still couldn’t keep up with everyone! My grandmother was in charge of the cash, Cameron was the seller and i was super busy online! Yes i was busy on my phone the entire day! My posts to the local yard sale site were off the chain! People were commenting like crazy wanting to know prices and availability, I must have had at least 100 people come just because of the posts I put online. So around 12:00 noon on Sunday I went on Facebook and posted everything you can carry for $10! Within a half hour we had dozens of cars pulling up. We sold almost everything we had! Time to count the Money! We still had the money from last week also we were stunned, we counted 5x! $986!! we couldn’t believe it, we made $328 each!! We still had a decent amount of things left after the yardsale. My grandmother went back to New Hampshire that Monday and my bf and I went to work. We had one week until the dumpster arrived. We got a notepad and started looking things up documenting their worth then we took photos of the things that were worth decent money and i went to work trying to sell them online. ie, craigslist facebook offerup. We sold quite a few things some furniture an antique camera some tattoo equipment and two of the larger exercise machines. After meeting with dozens more people it was finally Friday the dumpster would be here the next day and we damn near sold everything! we made another $560.00 in one week just selling online. My grandmother asked for just $100 of this to pay the rest of the dumpster fee. So on top of the $328 we made originally, we made another $230 that’s a total of $550.00 from selling things that weren’t even ours! I hope all this helps and inspires everyone to have a successful turnout at their yard sale! Krazy Mommy’s Christmas Kandles !